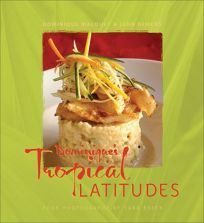 Chef Macquet (Dominique's Fresh Flavors) grew up on the tiny Indian Ocean island of Maruitius with the kaleidoscopic sights and smells of tropical cooking. Now firmly ensconced in New Orleans with a namesake restaurant, Macquet hasn't lost sight or taste for tropical cooking despite travels in South Africa, Southeast Asia and Latin America. He artfully incorporates all his influences here, blending low country cooking with fine dining to produce innovative tropical fare. More straightforward dishes include the classic Caribbean stew Pepperpot, and a thoroughly Cajun treatment of sauteed crawfish, tossed in a spicy remoulade and served atop fried green tomatoes. Others, such as Breadfruit Soup with Truffles and Foie Gras, or Sugarcane-Skewered Sweetbreads, are anything but peasant food. Most dishes, such as Key Lime Creme Brulee, Jerk-Marinated Roast Leg of Lamb and Braised Short Ribs with Debris Cakes are easy enough to recreate, though his Trio of Lamb (terrine, sausage and roasted rack of lamb) and Ultimate Meat and Potatoes (shredded beef brisket topped with malanga puree, seared foie gras and a fresh quail egg) call for culinary fortitude. Making the most out of regional staples such as mirlitons, conch and breadfruit both sets the book apart and makes it frustrating for cooks unable to source these crucial ingredients. That said, those with a soft spot for tropical cooking are sure to find this collection inspiring.